The lineup is George Washington, Abraham Lincoln, Thomas Jefferson, and Theodore Roosevelt--four of America’s shiniest presidents. But the original plan didn’t include these heads of state. In the mid-1920s, South Dakota state historian Doane Robinson had proposed a relief of Western figures, like Buffalo Bill and Chief Red Cloud, to entice more tourists to visit the state. Around this time, Gutzon Borglum found himself with some time on his hands after another mountainous monument project of his fell through (due to him being a jerk). That’s when Robinson invited him to work on Mount Rushmore. 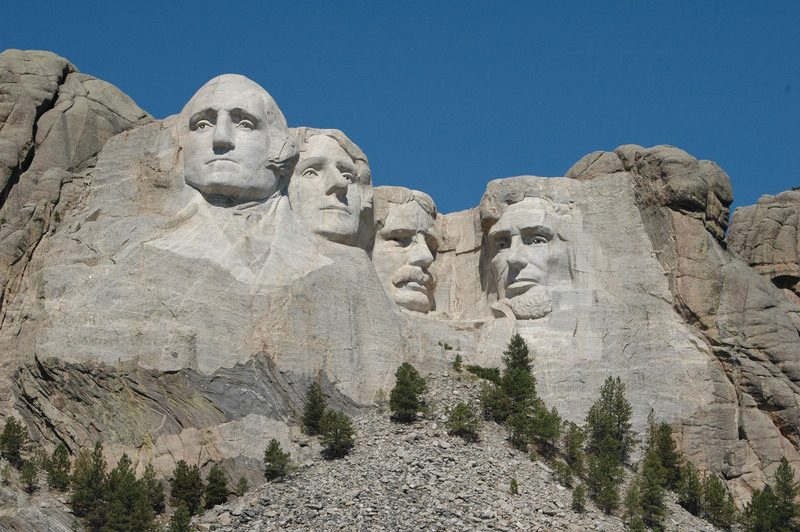 Borglum convinced Robinson to make the piece more widely relatable by doing 60-foot busts of presidents, instead of cowboys. He started the sculpture when he was 60 and worked on it for 14 years, with the help of a crew of 30 men at a time and lots of dynamite. He died before it was finished, but his son Lincoln saw it through to sort-of-completion (it still lacks many elaborate details that Borglum had planned, like the torsos of the presidents and a grand staircase leading up from the mountain’s base). Environmentalists of the day were scandalized by Borglum’s eagerness to dominate the natural beauty of the Black Hills. And understandably, many Lakota people in the area view a monument to four unwelcome white guys as a blatant desecration of their land. In the 1930s, Lakota Chief Henry Standing Bear commissioned an EVEN BIGGER monument to Crazy Horse, which was carved into a different cliff about 15 miles away. That’s an F U of historical proportions. Mount Rushmore has made a few cameos on the silver screen. Movie credits include Dances with Wolves, Nebraska, National Treasure: Book of Secrets, and most famously, Alfred Hitchcock’s North by Northwest. Hitchcock had obtained a permit to shoot the film’s climactic scene at Mount Rushmore, but the folks in charge revoked it at the last minute for fear of “patent desecration,” meaning that Al might have his actors prance around irreverently on the presidential faces. So his cast and crew shot some footage in the Mount Rushmore parking lot and cafeteria, but the good stuff (Cary Grant and Eva Marie Saint scrambling down Washington’s ears) was actually filmed on a very impressive Hollywood set.